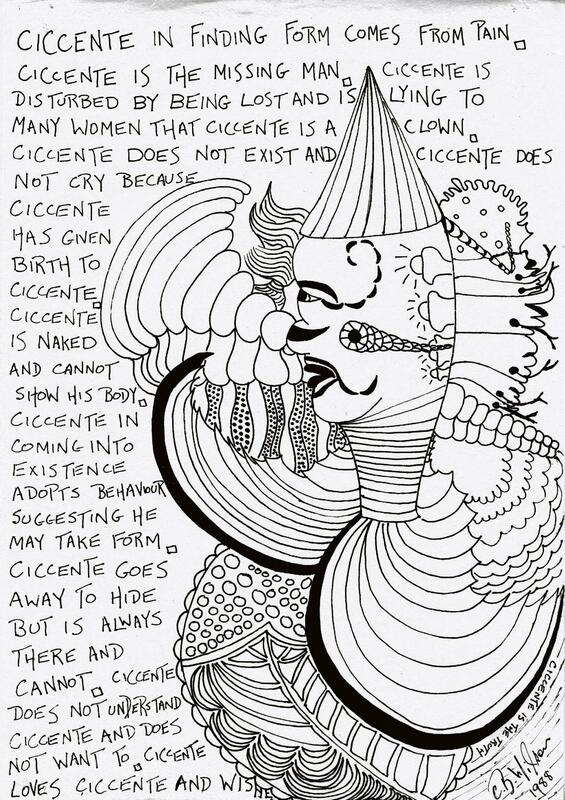 No other reason why I titled this satirical line drawing ‘Ciccente’ than liking the name when I heard it. A friend who was a traveller, a singer-composer-songwriter, jack-of-all-trades really told me about his impressions on meeting Ciccente, a co-worker in New York who washed dishes to contribute to the support of his wife and extended family. We exchanged stories. In a patisserie where I worked in Auckland, a giant of a man who was a Pacific Islander immigrant and sole support of his family washed dishes with water running off his giant arms and giant elbows making the floor slippery (although no-one said). I didn’t know his name. He didn’t speak. I started work at 6 a.m. without question. In the same year I lived at an address behind a rambling wooden boarding house of lodgers and my visitors were street people. I converted the walls of the shed into a display of art and writing-Primus. Audience genuinely enjoyed their viewing. I served hot tea and a steaming bowl of whole oat porridge at any time of the day when I was home. The rent I paid was a pittance. The unit was a converted claptrap of a shed formerly used for garaging a household car. Sometimes I visited premises up along the ridge of a decaying High Street where a coterie of youthful designers and musicians lived in vacant warehouses. They worked in menial occupations. A close friend was waiting to hear about an application for admission into an Art College. I had never thought of that. One shop front vendor I identified with because he too had worked at premises in the city where I did. I saw style reflected and recognised my own. 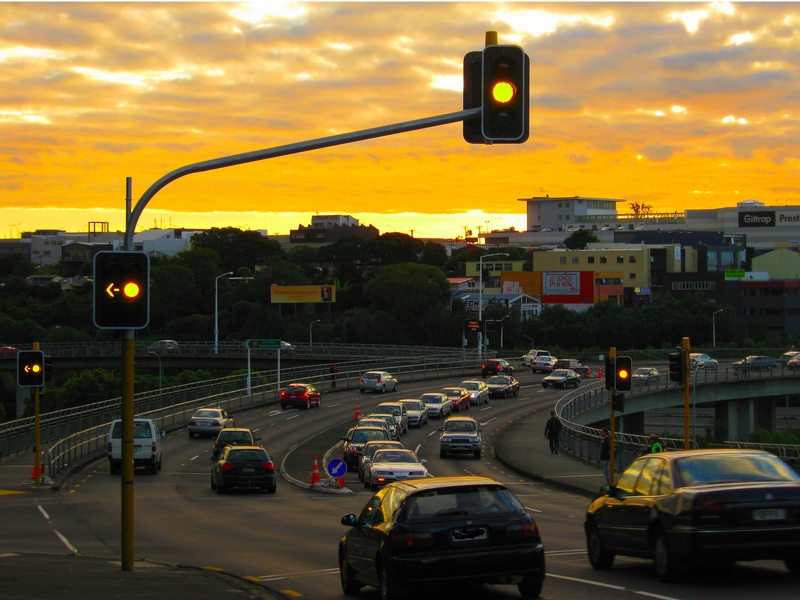 Meanwhile, the cost of living was soaring, yet these were heady days, made so by glimpsed roses in inner city straggling gardens and the rush of the traffic even on the overpass over Newton Gully. These are places in the city to-from where we do not usually stop a car and can barely look. I was one with knowing the city around me and sense of rush under me, walking with abandonment and abandoning a preconception given me I could not survive without support. We do generally survive arduous emotional events that we experience when we are parents. I had separated from my family to survive. We have to survive and find a way back. Shoe – on New Zealand. My fish shop has two lovely young staff (a 30 year old woman and a 21 year old young man). A month ago young Kes went to NZ for a much looked forward to holiday. He was to be away for 2 weeks. He wasn’t at the shop last week and he wasn’t there today. Annie told me that he is not coming back. He’s staying in New Zealand. We miss him. What a A-cool update. Happy and sad. Migration and community is so complex! if anybody realised entirely what they were doing in the first place, they would be unlikely to risk the loss of culture and community, family as well that is involved. There again, we bring each other these great riches between our two countries of Australia and New Zealand. That you miss him is a great testimony to the work he has contributed. All we can perhaps hope is our young friend has returned to family and his friends and a community under excellent circumstance and with a great deal of insight that is result of his experience here. He will miss you all. Glad your son is speaking and keeping in contact. The family if often a good shelter to take refuge in, often the only shelter we have. Migration is a difficult step to undertake. You are right, leaving home and going to a different culture is often heartbreaking. Young Kes may well come back. He is at the age when a prolonged adventure overseas is a good thing. This was his first time out of the country. He is a fun, polite, empathetic young guy. He and I both love scallops and fresh prawns and he always had a beautiful smile. He loved seafood. I am very glad to hear that you and your son are talking again. Not talking is just too sad. It is as if we never stopped, Vivienne. Thank you for your kind words. He will get busy again, of course. However, the amount of information that has passed between us that is personal has been satisfying. And as Gez says a family is a good shelter and…of course if we have one…or can make one. I hope we all finally find our very own shape and form, to be what we are meant to be, without fear or favour…be our true selves, honestly and openly…hopefully without suffering too much pain in the process, or causing too much sorrow to others…. Thank you helvityni. How difficult it really can be, this finding how to be and who we are…as you say without fear or favour. My life seems to be very full at the moment, helvi, with expressed emotion and pain and sorrow in the natural course of events, certainly not unhappy in view that to truly share experience is a delight. Thank you for your thoughtful comment. I appreciate that reflection. So very true – to share experience/s is a delight. One can learn a lot at the same time. Very thought inspiring piece Shoe. The writing and the art. How long did you live in New Zealand? I had a friend who lived there for I think about three years – she never forgot her time there and seemed to become part Kiwi, part Aussie. Later she spent some years in a south-eastern country in Africa (the name of which just won’t come to me at the mo) – she never forgot that either and came back to Melbourne with a husband and later step-family who migrated here but they set up home in Perth. I love the drawing and noticed the date of 1988. A lot of water has passed under the bridge since. You have lived a rather varied life and must have soaked up lots of experiences to feast and dwell upon. Some people live and work in the same place their whole life. One could have become an articled Clark for instance and shuffle off to the office at exactly 8.12 am, catch the 401 bus to George street to arrive punctually at 9am. At 10.30 am, the first of a cheese sandwiches is then consumed with a cup-o-tea, (one sugar stirred anti clock-wise). Apart from the occasional cough of the head Clark, the office is very quiet till 12 midday when two ( a vegemite and jam) sandwich with a daring Nescafe is ingested. There breaks loose a murmur of voices and some unscrew their thermoses. Then at 5pm a reverse trip by the 401 back home is undertaken by this brave articled Clark, where the wife greets him at 5.48pm with a regaling of her day with Mavis at the supermarket and how he better prepares himself to mow the lawn this coming Saturday . “Look how the grass has grown”? We all make our lives and one kind is not necessarily better or worse than the other. We do our best. Sandshoe: You are so right, ‘ we do survive arduous emotional events’. Thank you for your creative and encouraging words. We do our best you comment. Your comment is so kind, Gez. I am glad you love the drawing. We have these images of scraps of each other that are so meaningful in that case to the other. So interesting how we make compartments for our ways of seeing things. We end up with this great range of images to choose from making comparisons, making our ‘self’ map. Art is fascinating whether the viewpoint is audience or the artist’s. The brain under the analytical eye of an MRI scan while this activity is going on must be a sight to behold. This particular year (and you comment on that being a lot of water under the bridge since) was an intensive period for me of finding I could distill ideas through these images, but that people … of all ages …. were entertained. Thank you for your generous response, Gez.